When two Bay Area sisters bought a joint vacation property for themselves and their families in Tahoe City’s Dollar Point neighborhood, it was clear the original home wouldn’t work. 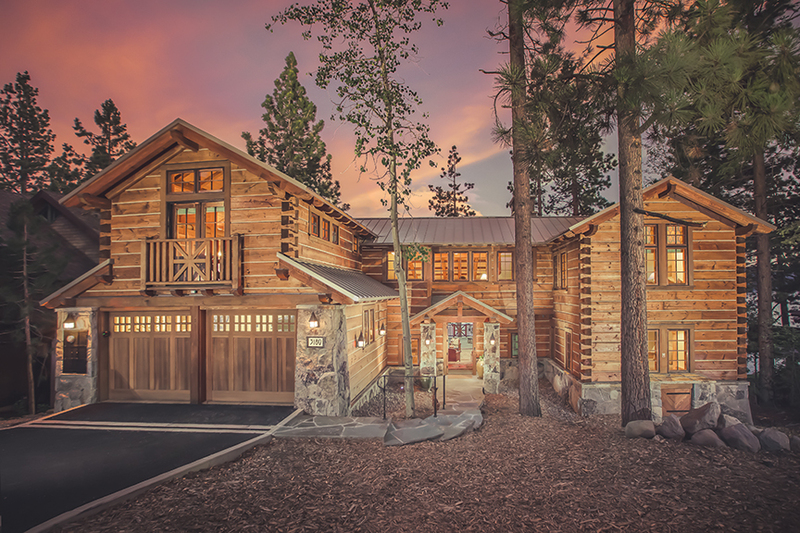 It lacked a garage, had narrow decks and failed to capitalize on stunning Lake Tahoe views. “We looked at renovating the home but quickly found that almost nothing of the existing layout would remain,” says lead architect Greg Klein, of Emeryville-based architectural firm John Malick and Associates. The original structure was replaced with a six-bedroom, seven-bath and two-half-bath home. Complete with two upstairs master suites, a billiards and media room as well as a half-court basketball court (one son is an aspiring basketball player, and the court is striped in the Golden State Warriors’ blue and gold for his favorite team), the house is impressive in scope. Yet, the structure truly comes alive and asserts its personality via its detail work—in the fine craftsmanship and artistry poured into the design and execution. A four-foot-wide quarter-sawn oak door with leaded windows and custom iron strap hinges opens into the lofty great room and its granite fireplace. 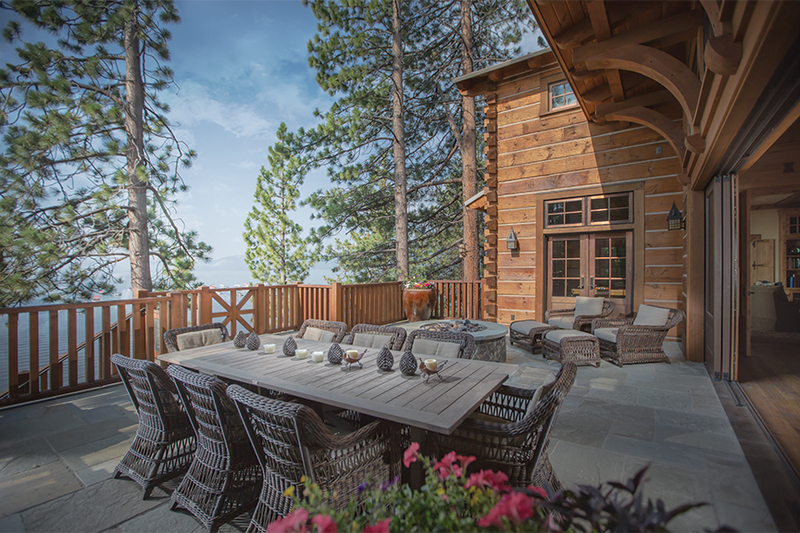 A large sliding door was framed so that it would pocket into the walls, resulting in an 18-foot opening from the great room onto the deck and its outdoor seating area, fire pit and stunning views of Lake Tahoe. Heavy timbers frame this room, as in the main openings through the home, with curved brackets—a detail that repeats in the great room ceiling and the exterior deck overhang and is echoed in the cabinetry and smaller openings. 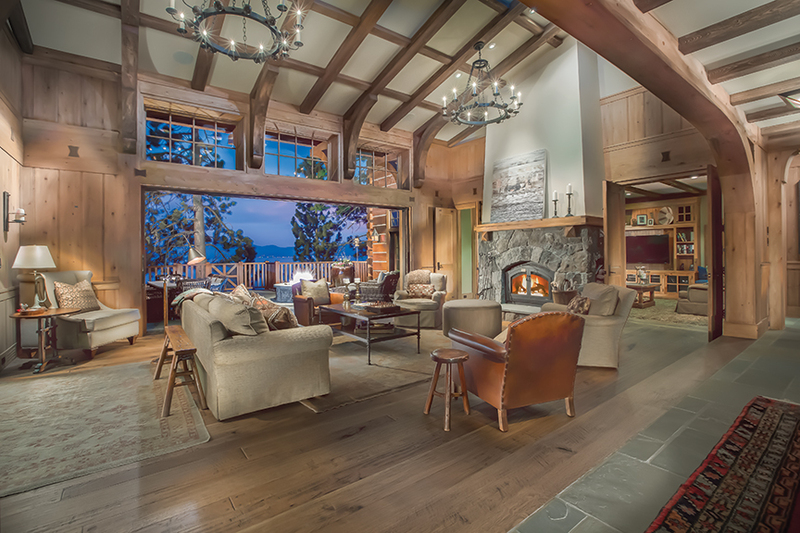 Floors are a hand-scraped white oak, and the tight knot, beaded pine paneling was custom-milled. In the kitchen, cabinetry are a quarter-sawn white oak, while the dramatic metal hood was forged by Loomis blacksmith John McLellan. The vanities were custom-crafted by Truckee’s Michael Holman Construction, and the home’s countertops are a cast concrete by Concreteworks of Oakland, which also designed the unique concrete tiles found in the bathroom. The home’s exterior is a gabled metal roof overtop a bighorn weathered granite base and heavy timber log siding with dovetail corners. “The dovetail joints were a challenge,” says Mt. Lincoln president Paul Zarubin. “They had to connect properly on the ends, but also have proper spacing for chinks and had to line up and wrap around the entire house.” The joints were cut and milled in Washington, the only piece of the woodworking done offsite. Windows and exterior doors are copper-clad. Beautiful mahogany doors were salvaged from the original structure and reused in the home’s lower level. The deck flooring is a Connecticut bluestone by Verdi’s Eric Schwedt Stone & Masonry. On the lower level of the home is a gym with expansive lake views and the basketball court. Lights are flush mounted to the 16-foot ceiling, and the foundation was redesigned after it had been poured to gain an extra six inches. “We did everything possible to get as much height as we could,” says Zarubin. Construction took about 16 months and the family was able to spend the 2013 holidays in the home, enjoying the property’s amenities, views and craftsmanship.